Leticia Juarez is a general assignment reporter for ABC7 Eyewitness News in the Inland Empire who joined the station in 2010. Leticia grew up in San Bernardino and graduated from Cajon High School. Leticia holds a bachelor's degree in international political science with a specialization in business from UCLA. Leticia began her career as an intern at a cable station in Palmdale but quickly transitioned to general assignment reporter. She reported on the kidnapping of two Antelope Valley teens, which launched the state's first Amber Alert. In 2003, she was hired as a producer/general assignment reporter for KMIR-TV in Palm Springs. During her tenure, Leticia reported on the California wildfires in which her own family's home had to be evacuated. She joined KERO-TV in Bakersfield in 2005 as a general assignment reporter. 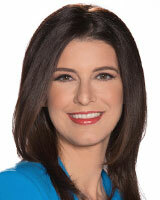 Leticia left California in 2007 and headed to Houston, Texas as a morning reporter for KHOU-TV. In September 2008, Leticia covered Hurricane Ike as it hit the Bayou City. In the aftermath of Ike she filed stories on the search for the missing and the recovery efforts. She joined KIAH-TV in 2009. Leticia's reporting on the Gulf oil spill from Louisiana earned her a Lone Star Emmy Award for her series on "First Eyes on the Black Tide." Leticia is excited to be back in California and reporting in her hometown. She enjoys travelling, cooking up her mother's enchiladas and trying out new restaurants with her husband. Authorities busted one of the largest marijuana cultivations ever uncovered in the city of Riverside. A simple request for a San Bernardino County Sheriff's Department patch turned into a mission for Deputy Meagan Forsberg after the father of a 14-year-old boy with autism reached out to her. The city of Riverside offered a reward for information leading to the arrest of those involved in the shooting of a professional boxer.